It all just came together. I don't know how it happened! It just did. So, according to my protocol, when something in the kitchen-creation department unexpectedly works out on a first attempt, I call my little sis to tell her about it as my mouth waters and I talk a mile a minute about ingredients. Maybe it comes off as a bit braggy but my belly is usually so stuffed that I've lost my normal sensitivities. So that's why my sister is the recipient of these one-sided phone conversations. She listens, acts incredibly interested, requests samples to be over-nighted to her (yeah right...) and even chimes in inquiring about portions or her plans to make the new recipe for her family. Oh, and she's my blood and recieves ALL my little girls' hand-me-downs for her little one, meaning she's obligated to listen to my recipe hype! These little lovelies carried our fifteen minute conversation from my home departure to my arrival at my girl's school. I'm pretty sure Andrea didn't get a word in edgewise...except for, "How did that work? I mean, that's amazing that all of that held together." 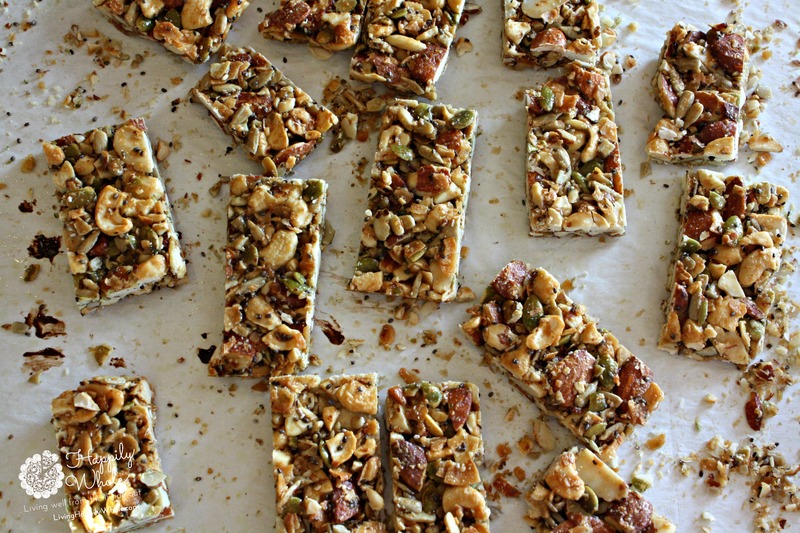 With the majority of the bars you can buy at the store containing unsavory ingredients, non-nutritive fillers and unnatural sweeteners, a recipe like this one is truly a treasure. You can recognize and easily purchase every single ingredient (go ahead, read the ingredients labels of store-bought bars...not so recognizeable, huh?). In just a short amount of time, you can create a large number of bars for less money than the typical $1.89 to $3 it costs to purchase a bar of any real-food, natural, organic health value. 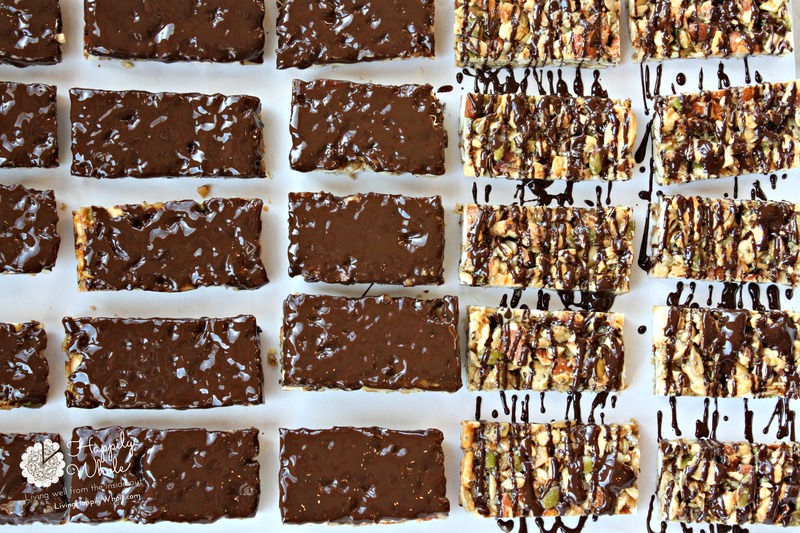 The nutrition alone is reason to start baking your own bars. I mean, come on! Plant based nutrients (phyto-chemicals), more minerals than you can ever ask for, chock full of fiber, complete protein and NO processed ingredients, GMOs, false claims, etc. Shocking but true, for just one day I'd decided I was tired of nut butters. 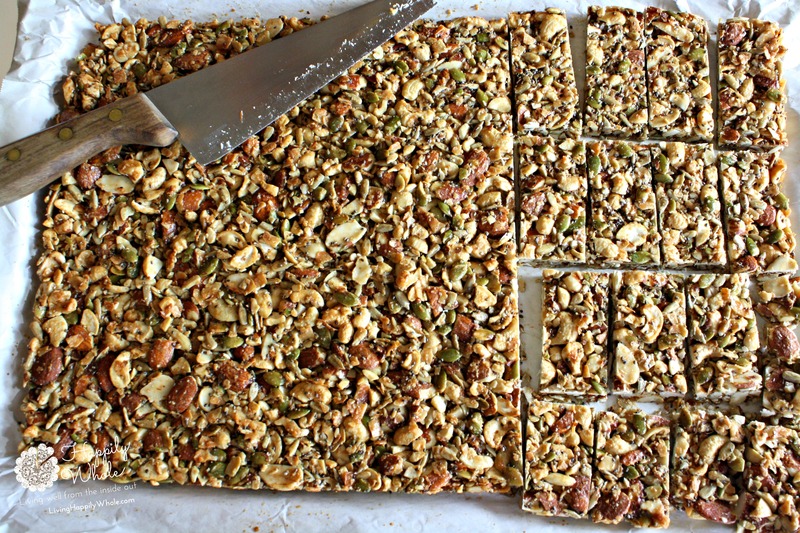 So, unlike any of my other homemade bars, I used NO nut butters and only the WHOLE, RAW nuts and seeds, all nicely toasted, to create this delicious and incredibly healthy bar. Your body will thank you...that's all I'm saying! Prepare: You will need a large mixing bowl, a jelly roll (15x10) inch pan lined with parchment paper hanging off all sides, a food processor and a small saucepan and/or a double broiler. 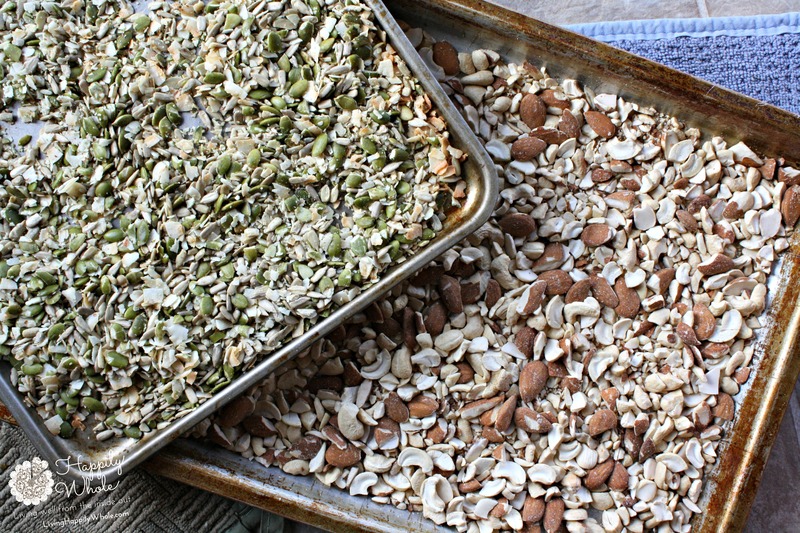 Place your 3 cups of nuts on one large pan and your seeds and coconut flakes on another large pan. 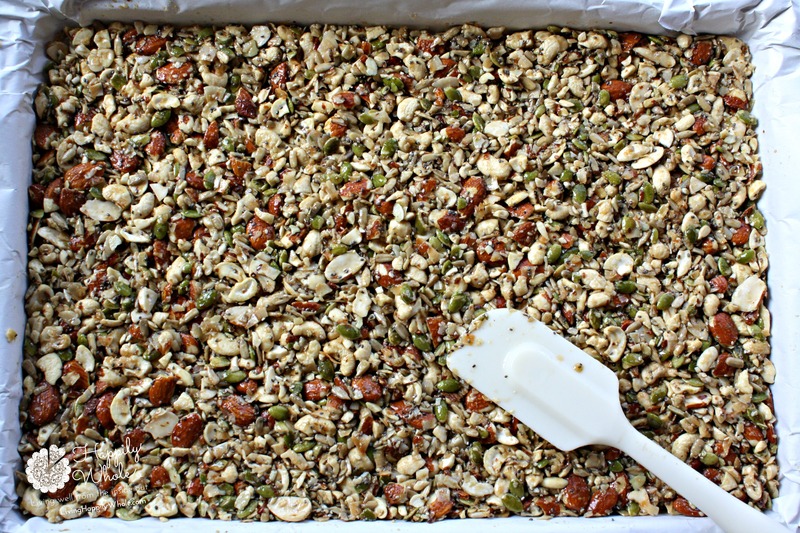 (I use my jelly roll pan for the nuts and a smaller metal pan for the seed mix). Put both into the hot oven. Toast for 10 minutes. Take the pans out, stir and place back into the oven. Toast the seed mix another 5 to 8 minutes and remove from oven. Allow the nuts to remain in oven for an additional 10 to 12 minutes (total of about 20 minutes). Allow to cool for a few minutes. While they cool, put the maple syrup and coconut oil into the small saucepan. Bring to a boil, stirring frequently. Allow to boil a couple of minutes while you are stirring. Remove pan from heat and add the salt and vanilla. Stir to combine. Go back to the nuts and seeds. Place the nuts into your food processor and pulse to chop them up coarsely. You may have to do this in batches if you have a small processor. Pour them into your large mixing bowl. Put the seed/coconut flake mix into the food processor and pulse to break the pieces into an uneven, coarsely chopped mix. Pour into the large mixing bowl with the nuts. Add the chia seeds and flax meal to the mixing bowl. Stir to combine all dry ingredients. Pour the maple syrup/coconut oil liquid mixture over the dry mix and stir to coat well. Put the entire thing into the parchment prepared jelly roll pan. Press down WELL and EVENLY. Use some muscle! Bake for 25 minutes. Remove from oven and let cool completely. Lift the bars using the parchment paper edges onto a cutting surface and cut them into your desired size bar. The bars are delicious AS IS. But if you want to add some dark chocolate, you've got one more step! Melt the chocolate and coconut oil in the double broiler (or you can do this in a microwave--just do it in short increments and stir in between so the chocolate does not burn). You can decorate your chocolate bars any way you'd like! I dipped the bottom of some for MORE of a chocolaty taste. Others, I simply drizzled chocolate over. *ALL the nuts and seeds I used were raw and organic. When you can find raw, unpasteurized nuts and seeds, it's your best option. The beneficial nutrients and enzymes have not been distroyed in processing. **I used the Enjoy Life brand, dark chocolate chips. I have also chopped my own 72% dark chocolate bars up to equal about 10 ounces. Take it to the Table: Grain-Free Spaghetti Squash Pasta with Grassfed Beef. 8 Easy Ways I Make Living Well Work...well, NOW 9!